Le Laboratoire Cambridge Is Coming! A unique experience for ES20 students, the Idea Translation Fellowships program provides students with opportunities to further advance and prototype their ideas developed as teams during the course through fellowship experiences abroad. Annually, nearly 100 students from Idea Translation and ArtScience Prize programs around the world attend a week-long workshop at ArtScience center Le Laboratoire in Paris, France to work with designers and experts that help them move their project ideas forward. ES20 students gain access to the further opportunity to prototype their ideas as teams during a month-long fellowship with partners in Cape Town, South Africa. This fellowship opportunity is made possible by generous contributions from lead sponsor the Harvard Global Health Institute (HGHI). The Wyss Institute for Biologically Inspired Engineering, the Experiment Fund , and ArtScience Labs also provide funding and program support. See what the ITL Summer Fellows accomplished in 2012 on the ITL 2012 Fellows Blog. 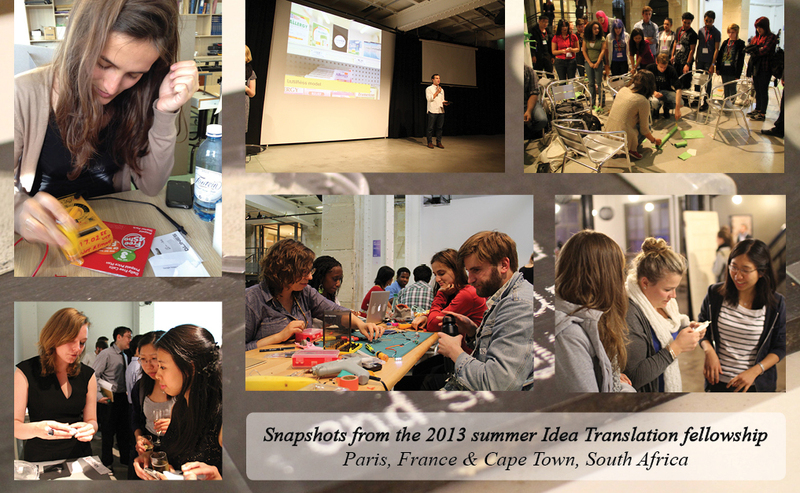 See what the ITL Summer Fellows accomplished in 20111 on the blog: Idea Translation Lab in Cape Town. Results of the three-year pilot collaboration between the Idea Translation Lab and the HGHI Technology Innovation Working Group have been very promising, both in terms of student enrichment and the creation of innovative new technologies and organizations in global health. Lebônê, comprised of six Harvard students seeking to develop a microbial fuel cell technology to provide off-the-grid lighting in Africa, went on to win a World Bank grant in 2008 and funding through the MIT IDEAS competition in 2009, among other awards and honors. Lebônê has been featured in the New York Times, MIT Technology Review, and other media. LifeCell: Creating a water filtration and transportation device modeled after the biological cell. VertiGrow: Designing a vertical planting system to permit agriculture in urban slums. 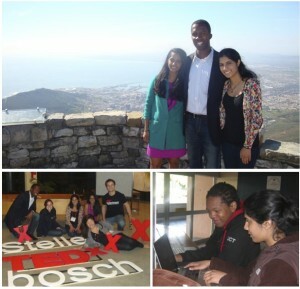 In August 2010, in collaboration with students from Cape Town and University of Stellenbosch, The Laboratory at Harvard helped to co-organize the 1st annual TEDx innovation conference at the University of Stellenbosch:www.tedxstellenbosch.org This ideas event featured original and inspiring talks from some of South Africa and Africa’s most compelling thinkers and innovative doers, along with over 500 attendees, with topics on Community, Storytelling, Innovation, and Nature (with Africa). See exciting videos as we release them here.